Led by Ananth Kalyanaraman, associate professor in the School of Electrical Engineering and Computer Science, the researchers have received a 3-year, $1.2 million grant to help biologists sift through large amounts of data on plant traits and the environment to determine and ask important questions about their work. The multidisciplinary team will focus on improving understanding of the interaction between genes and the environment to create better corn crops. Scientists know that genes play a vital role in crop yields and characteristics, but how genes act with the environment can be almost endlessly variable. To improve crop yields, scientists have mostly tried trial and error efforts — putting a crop into different environments and seeing how it fares. Unlike many other scientific fields, and because of plants’ vast complexity, there are no computer models to predict their behavior. In recent years with technology improvements, plant scientists can quickly gather huge amounts of data and a variety of information about their crops, but then they have to figure out what data might be most important. “It is a data deluge,” said Kalyanaraman. Using consumer point-and-shoot cameras controlled by Raspberry Pi micro-computers to collect time-lapse videos of maize plants growing at Iowa State University. Photo by Patrick S. Schnable. So, for instance, Kalyanaraman obtained corn data from research fields in Nebraska and Kansas. There, Patrick Schnable, a plant scientist from Iowa State University, and his team were studying two similar varieties of corn at both sites. For several months, the researchers took photos every few minutes to study important growth indicators such as branch width, crop height, or leaf angles of the corn. 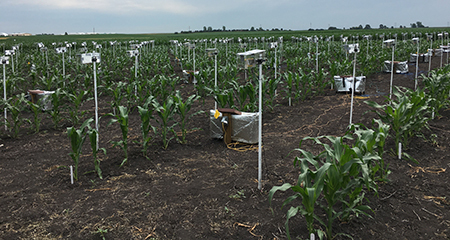 They also collected data for each plant on more than 20 variables that impact crop growth, such as soil moisture, nutrients, temperature and precipitation. The researchers gathered information on each plant, and there were thousands of plants growing in each field. In a preliminary study, the researchers found that one corn variety was growing at the same rate in both locations, while the second, similar variety grew like the first variety in Nebraska and completely differently in Kansas. “There are unknown subtleties in subpopulations of the plant varieties that made the plant behave differently,” said Kalyanaraman. Of course, the researchers want to know which factor, specifically, might affect the second variety’s growth. With support from the new grant, Kalyanaraman’s interdisciplinary group, which includes researchers from computer science, molecular plant sciences, mathematics and genetics, will develop tools to better identify what might be valuable in the data, helping the researchers to ask broader questions, find possible hypotheses out of a large amount of data, and conduct tests in a more targeted fashion. The researchers will also develop a better way for scientists to view their data in a way that helps them better make connections. Developing such tools requires a combination of math and computer science work to render the data visually. The work, says Kalyanaraman, could transform the way that researchers study crops. “This will usher in a new era where biologists can use interactive, informative and intuitive tools to spearhead data-driven hypothesis extraction and discovery,” he said. In addition to Schnable from Iowa State, the research team also includes mathematician Bala Krishnamoorthy, statistical geneticist Zhiwu Zhang from WSU, and visualization expert Bei Wang Phillips from University of Utah. The work is in keeping with WSU’s Grand Challenges, a suite of initiatives aimed at addressing large societal problems. It is particularly relevant to the challenges of Smart Systems and its theme of computing and data and to Sustainable Resources and its theme of food production.